This simple plug and play webcam from Sumvision does not skimp on features. Dont be fooled by the size, the new Panther is capable of a video resolution of a huge 5 mega pixel! 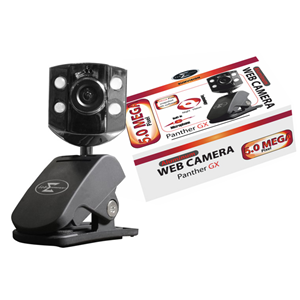 Thats not all, the webcam also has a built in microphone perfect for chatting with loved ones over the internet. The conversation doesnt need to stop even if its late into the night thanks to the high quality night mode which activates LEDs around the camera, giving outstanding imagery even in dark conditions.